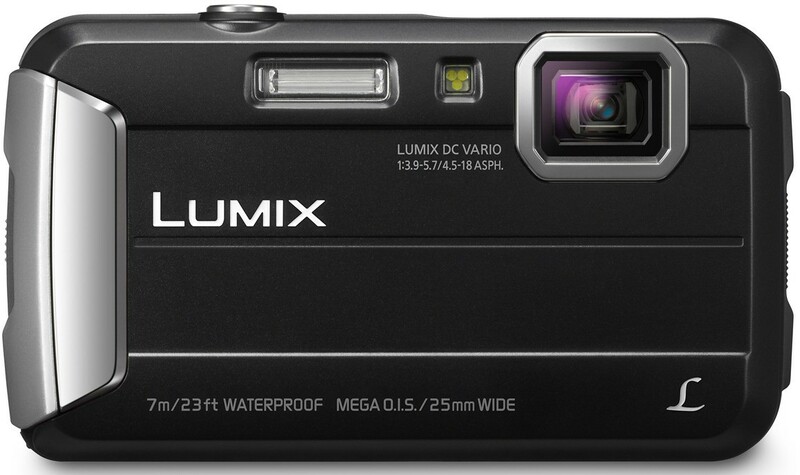 Panasonic's Lumix DMC FT25 may not look like much, but it packs some pretty surprising performance in a rugged package. It's not the best of its class, but it's ready to go wherever you go. Panasonic's ignored some of the features we've come to expect from cameras of this range such as GPS and Wi-Fi. Even still, the DMC FT25 manages to outperform many of its competitors simply due to its portability and ease of use. The DMC FT25 is a functional-looking camera measuring 2.3 inches tall, 4.08 inches wide and only 0.77 inches deep. It weighs in at just over 5 ounces, making it even more portable than some of Sony's offerings. The controls are very basic with a corner lens and flash on the front, power and recording buttons on the top, a 2.7" LCD screen with somewhat small navigation buttons on the back, and a double-locked door covering the battery and card slot on the side. The camera has a slight grip to it, though it may be difficult to hold when wearing gloves. The DMC FT25 is waterproof up to 7 meters, shockproof up to 1.5 meters, and handles temperatures as low as –10°C (14°F). The camera is also dustproof. This camera is surprisingly tough for its size, which is good news for anyone who expects to lug it around wherever they go. The DMC FT25 supports a maximum video resolution of 720p, which is good enough for cameras of this class. The sensor takes 16 MP images that does a pretty good job of adjusting to different light conditions. We didn't see any washed out colors or highlighting during our tests. The camera's built-in autofocus managed to work well in good lighting, but struggled somewhat in darker settings. However, we did see some issues with close-range details appearing blurry, and noise is apparent even at low sensitivity settings. Panasonic's added a feature to the DMC FT25 known as Creative Control, which provides presets for balancing the exposure and color qualities of the image. In addition, the DMC FT25 supports a burst mode that takes several photos at 8fps, as well as a burst mode that takes images indefinitely at 1.3fps. The camera's f/3.9-5.7 aperture is fairly standard for its class and offers built-in image stabilization that works surprisingly well. The DMC FT25 can take about 250 pictures on a full charge and about 50 minutes of video. While the battery is nothing to write home about, the camera performs respectably. With a short start time, a shutter speed of 8 - 1/1300 seconds, and an autofocus that quickly finds its target, taking pictures is a treat. As with most other cameras of this class, there's a single microphone that records mono audio, but more than likely you're not buying this camera for its sound quality. The DMC FT25 comes with little in the way of accessories. Out of the box you get a hand strap, battery pack, and battery charger. Panasonic does include desktop software for important and editing your recordings. The DMC FT25 is durable enough to take outdoors, but compact enough to take with you wherever you go. It doesn't have a lot of features, but it does a great job of taking basic photos and video. For the adventurer who wants a simple point-and-shoot, this camera is for you.